WHEN you walk into your hotel room and one of the first things you notice is a Blondie LP on top of a stack of records, you know you’re in for a good time. But rewind a couple of hours earlier when I was reading reviews for Shoreditch’s Ace Hotel onboard the 8.35am from Doncaster to London Kings Cross, I was full of worry - was it going to be just a bit too hip for me? The retro decadence of the Hoi Polloi restaurant. In the heart of trendy Shoreditch High Street, Ace Hotel is part of a chain of too-cool-for-school hotels founded in Portland, US, and everything about it is achingly hipster. I was convinced that I - definitely more beans on toast than smashed avocado - was going to stick out like a sore thumb. Walking into the lobby, full of millenials on Mac laptops, this 30-something honorary Yorkshire lass was in danger of feeling distinctly uncomfortable, but the receptionist instantly put me at ease. After some recommendations for local bars to check out later, I was given the key to my suite. And there, along with the Blondie record, and eclectic book selection (Wills of the Rich and Famous, anyone? ), I started to relax. Much like downstairs, the decor had a distinctly industrial, New York loft vibe, with a bit of extra comfort amid the exposed pipework and chipboard ceiling. The suite itself was bigger than you’d expect for central London, with a balcony bigger than my own backyard. Next to the record player was a full-size Smeg fridge freezer, stocked full of wine, local craft beers and mixers. A guitar hung above the stack of records. A retro-style vintage sideboard hid the kettle (and, win, Yorkshire Tea). Everywhere you looked it was just, well, cool. Suitably impressed, we headed down for lunch at the Hoi Polloi, the hotel’s aptly named restaurant. Entering from the lobby bar, you are greeted with a mixer desk and turntables, continuing the theme that would make this hotel a music-lovers spiritual home. But once we were seated, the records were soon turned off as a string quartet struck up an unlikely catalogue, which included Lady Gaga, Nirvana, and Prince. Menu gazing was quickly forgotten about as we got swept up in the music. It really was a delight, and with the restaurant (the interior of which kind of reminded me of a the BHS cafe circa 1985, but with extra plug sockets for your laptop) not overly busy for a Saturday lunchtime, it almost felt like a private concert. But we were there to eat, and after a morning exploring the nearby Old Spitalfields Market and Brick Lane, the crispy lamb, kohlrabi, watermelon and watercress salad went down a treat. The hotel is well located for a break on foot. Close to Old Street tube for those wanting to explore further afield, but within walking distance of Tower Bridge, and plenty of trendy shopping spots and cocktail bars on its doorstep. If street art is your thing, Shoreditch is covered in it, so remember to look up and see the outdoor gallery on every other building. Speaking of art, one of my key reasons for heading to London was to see the V&A’s exhibition on Mexican artist Frida Kahlo, Making Her Self Up. Now, I won’t embarrass myself by writing just how much I love Ms Kahlo, but I will tell how I had been desperately excited about seeing not only a number of her works, but her personal belongings right here in the UK. My love for Frida goes back to when I was 16 and studying for my art A Level, heading to Nottingham’s main library (I did say I was an honorary Yorkshirewoman) to place an order for the only two books that existed in the city’s library service. Fast-forward a few decades and the total transformation of the internet, and now you can learn Frida’s story at the click of a few buttons. But then, those books took me to another world. One of pain, perseverance, and huge talent. Now, pretty much every other stall at the markets we visited earlier in the weekend sold something emblazoned with her image or inspired by her style. The proliferation of everything Frida-esque is something of an uncomfortable bugbear for me. Almost like sharing a special friend you’d know for years who suddenly becomes very, very popular. Four years ago, that special friendship had taken me to Casa Azul in the Coyoacan district of Mexico City, Frida’s family home, which now houses the Frida Kahlo Museum. It was an unheard of partnership with the V&A that allowed so many of her personal possessions, some of which had been locked away in her home for 50 years following her death in 1954, to leave Mexico for the first time and be shown alongside her work. Despite having seen much of the content before at the Frida Kahlo Museum, the presentation of her personal items, such as make-up, sunglasses and prosthetic leg, set alongside letters, film and of course, her haunting and wonderful self-portraits, shone new light upon my idol. The imposing collection of her clothes alone, displayed on mannequins made to proportion with flowers in their hair, made the trip worthwhile. But back to the hotel and we were sat on the balcony, enjoying a couple of drinks while watching the hustle and bustle of the High Street at night, skyscrapers, including the famous Gherkin, lighting up the skyline, a world away from Frida and her beloved Mexico. A wedding party was in full celebration on the rooftop bar, but once inside, it was peaceful, and we enjoyed a great night’s sleep after enjoying dinner once again in the Hoi Polloi. We were back again in the morning for breakfast, having been tempted by American-style pancakes and bacon. And what a breakfast it was. High plaudits came from my other half, who described the Full English as the best he’d ever had, and the coffee set us up for the day. I would say that it capped off the stay, but another treat was in store as we headed to the lift to collect our things. The most beautiful, friendly dog, I’d ever seenshared our lift (luckily I don’t think my own pup will read this) . Yes, Ace Hotel is dog friendly. Although it’s doubtful you’ll get to meet the same one, I think the possibility alone makes it worth a trip. 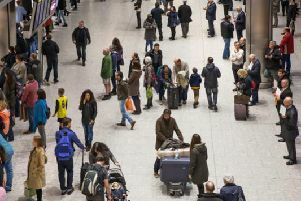 We traveled to London with Grand Central, which was ranked as Britain’s best value long-distance train operator for the sixth year in a row in the Spring 18 National Rail Passenger Survey. Visit www.grandcentralrail.comww.